BRAND NEW! 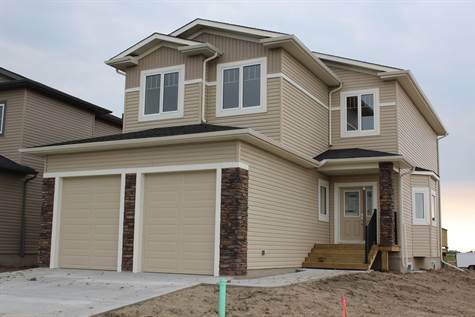 This 2369 sq ft 2 storey brand new home is built in the wonderful community of Whitetail Crossing in the Town of Mundare, only 40 minutes East of Sherwood Park. The builder did not spare a single detail when building this home, hardwood floors, granite, central air and the list goes on. Great layout with an open concept main floor, huge kitchen with dark cabinets and granite countertop, gas range, large eating bar, nook surrounded by windows, raised gas fireplace in the great room, surrounded by stone work, upgraded lighting throughout the home, main floor den PLUS a flex room! On the upper level there are 3 very generous sized bedrooms and a bonus room. The master suite features a luxurious ensuite complete with large shower, double sinks and soaker tub. Double attached garage with one tandem bay allowing lots of extra space for parking and storage or for your golfcart, always loaded and ready to hit the fairways of the wonderful golfcourse only steps from this home. Town of Mundare tax incentive applies.